Britain is bracing for the coldest night of the winter so far, with "significant snowfall" likely to cause further travel delays and school closures. Temperatures of minus 10 degrees Celsius (14F) are possible in parts of the country in the early hours of Thursday, with this winter's record of minus 10.8 C (12.6F) expected to be broken, the Met Office warned. 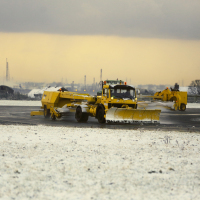 Airports temporarily closed Snowfall brought Manchester and Liverpool airports to a standstill on Wednesday morning and several schools in the cities closed their doors owing to the harsh conditions. Gritters worked to clear roads across the north west as commuters were warned over tricky conditions and long delays by Highways England. The disruption is set to deepen with a weather system arriving from the south west and pushing north on Thursday. It is forecast to bring a widespread harsh frost along with freezing fog and significant snowfall, with several centimetres possible across parts of England, said Met Office meteorologist Alex Burkill. Yellow weather warnings for snow and ice cover the majority of the UK on Wednesday until midday - with only a narrow sliver of the country north-east of Carlisle not affected. Further warnings have been issued for Wales and most of England on Thursday and Friday, taking effect from 3pm on Thursday until midday on Friday. Snow is likely to settle, meaning Friday could be a snow day for many, but some uncertainty remains, Mr Burkill said. Areas of higher ground could get up to 10cm of snow while several centimetres are possible across lower-lying areas. Mr Burkill said: "It's what happens on Thursday that has the potential to be more disruptive. "It does have the potential to bring some very significant snow. We have already got a warning out in force for it. "It's currently just a yellow warning, but it's not out of the question that will be ramped up nearer the time. "It's looking like it will be a spell of persistent snow." The year's record low of minus 10.8 C (12.6F) recorded in Braemar, Aberdeenshire, on January 18 is also likely to be beaten, most probably in the north of Scotland, but parts of England could also see negative double figures, Mr Burkill said. Benton, in Oxfordshire, and Santon Downham, Suffolk, are among parts of England which could be coldest, and temperatures across southern areas are forecast to dip to around minus 8 C (17.6F). If you're scheduled to make a getaway over the next few days, make sure you have the right travel insurance cover in place to protect against any unforseen circumstances.